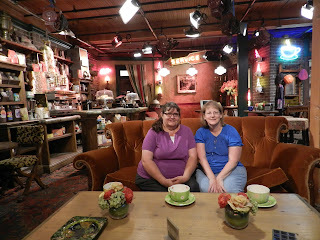 Anita Mae Draper and I are in Anaheim, California, to attend the Romance Writers of America conference later this week. We’re also getting ready to meet Susie Dietz (this afternoon!) and have a little fun time in my favorite place – Disneyland and California Adventure. But before we get there, we had to make it here. We both started out on Thursday with Anita headed for Vancouver, British Columbia and me to Seattle. 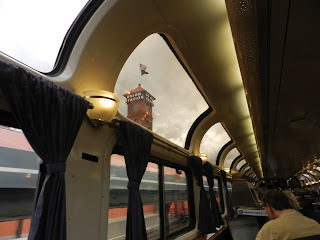 Our plan was to meet at Seattle’s King Street Station on Friday morning where we would board the Coast Starlight and head to sunny California. Thursday was an unusually beautiful day in my part of Washington and since we usually share our weather with Vancouver, I sent Anita a text telling her I ordered the weather just for her. 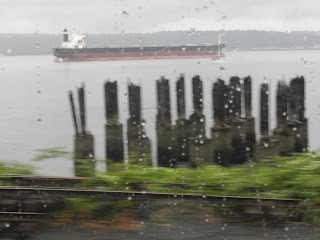 I went to bed in a Seattle hotel expecting to wake up to sunshine. Instead I woke to one of the heaviest downpours I can remember. To make things even more interesting the six mile trip from the hotel to the train station took almost forty-five minutes, shattering my plan of arriving at the station before Anita. Amtrak has employees called Red Caps who transport passengers from the station to their rail car and vice versa. While I was checking in at the ticket counter my husband found a Red Cap to take us to the platform so I wouldn’t miss the train. Everywhere I turned, I scoped out the passengers trying to find Anita but she was nowhere to be seen. We left the station and headed toward the platform (back out in the rain) and as we drew close to car 1130, there stood Anita on the platform. Since she arrived before me and it was time to board she headed toward the platform hoping to find me, only to be told she couldn’t board because my name was on the room reservation – even though she had her ticket in hand. As you all know, Anita is wonderful at documenting with the camera. 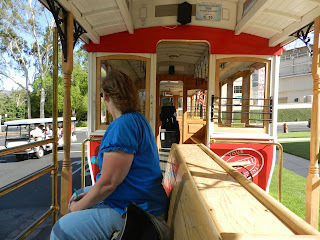 Below are some highlights from our two days on the train and our first day in Anaheim. blue skies, sandy beaches and about an hour and a half of sunshine! we spent Sunday afternoon touring Warner Brothers Studios. Does this place seem familiar? "I'll be there for you, cause you're there for me too"
Hmmm... 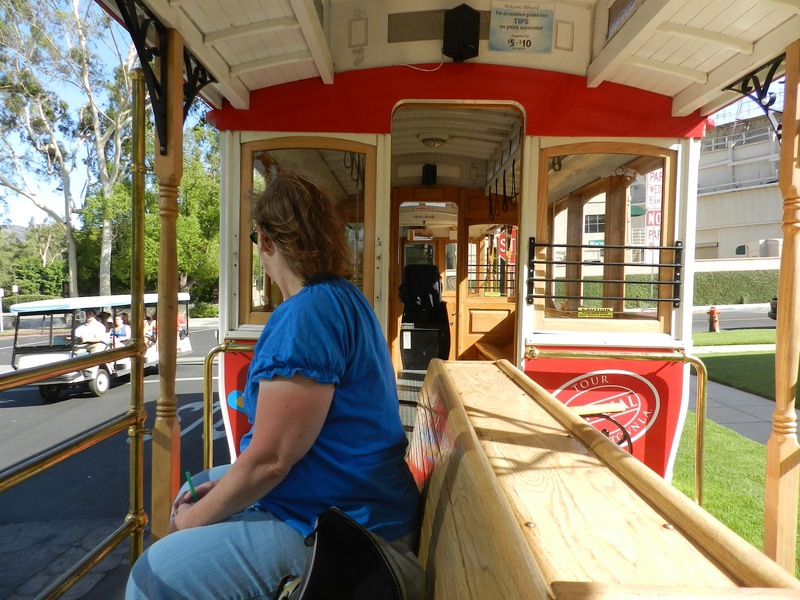 If you think this looks like a trolley car, think again. With only two passengers , the driver decided it might be fun to fly down the Los Angeles freeway leaving us with rattled jaws and the need for a chiropractor. I don’t know about Anita, but since I hadn’t met her in person I didn’t know what to expect and I might have been a wee bit nervous. Would we get along? Would we be able to laugh together? Did we have anything in common besides our faith, our love for writing, and our Inky blog? That was Friday morning and it’s now Sunday night. After three days of rather, um, interesting experiences (some fun, some not so fun, and some downright weird) we’re still laughing and smiling and looking forward to our next adventure. Tomorrow (oh, wait - it's today - in just a few hours!) we hit the beach in an old "Woody" bus with the Beach Boys playing on the radio. 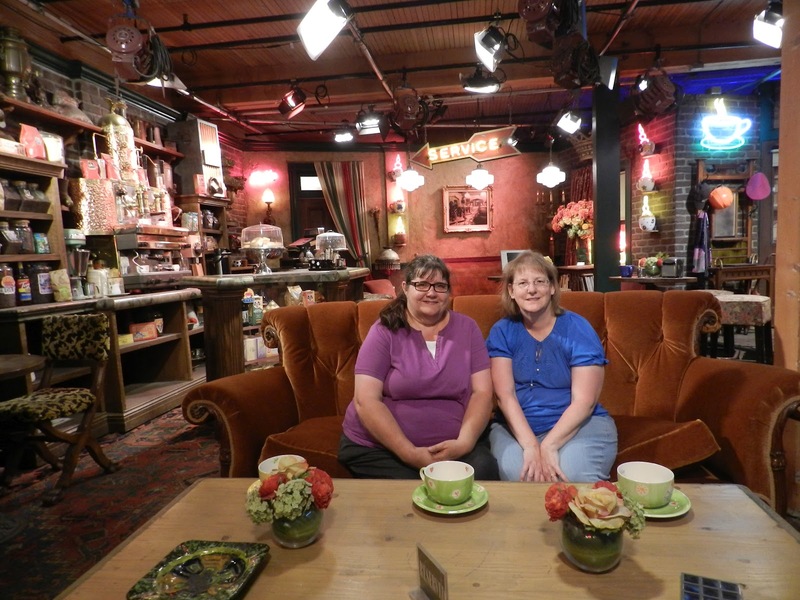 Then we'll meet up with Susie Dietze and her family in the Disney park. There’s an old joke that people in Washington don’t tan, they rust. It’s not true of course, but Anita and I did experience a lot of rain before we hit Santa Barbara. I always joke that I’m going to scare people in California with my extra pale skin. This time, however, the joke is on me. 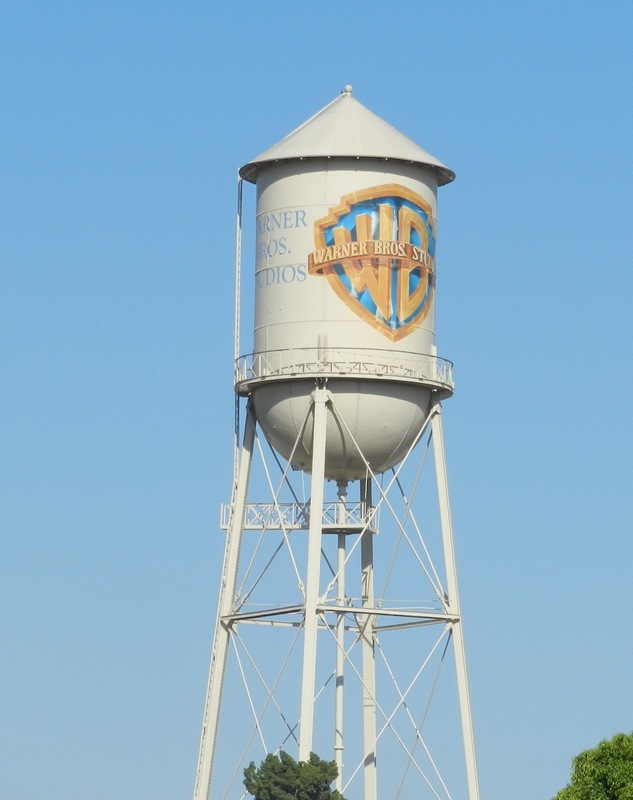 I may have been a blinding shade of white when I woke up on my first morning in Anaheim, but after our day of touring Beverly Hills, Hollywood, and Warner Brothers Studios – my skin is now twelve different shades of red. **Disclaimer: Please excuse any typos because Anita Mae and Suzie Jo are extremely tired and quite possibly delirious. After being bounced around on a train and juggled, shaken and stirred on the trolley, as well as being severely sleep deprived, this post may not make any sense. However we will try to embellish share more of our adventures one day soon. Suzie and Anita, it's great to see you're both having a fabulous time together :) I would love to see more of the West Coast one day and attend another US conference. Have fun at RWA! sounds like fun! Enjoy the rest of your time! Thanks, Narelle. This is certainly an amazing experience. As my first time to Washington, Oregon and California, I was about glued to that seat in the Parlour car. 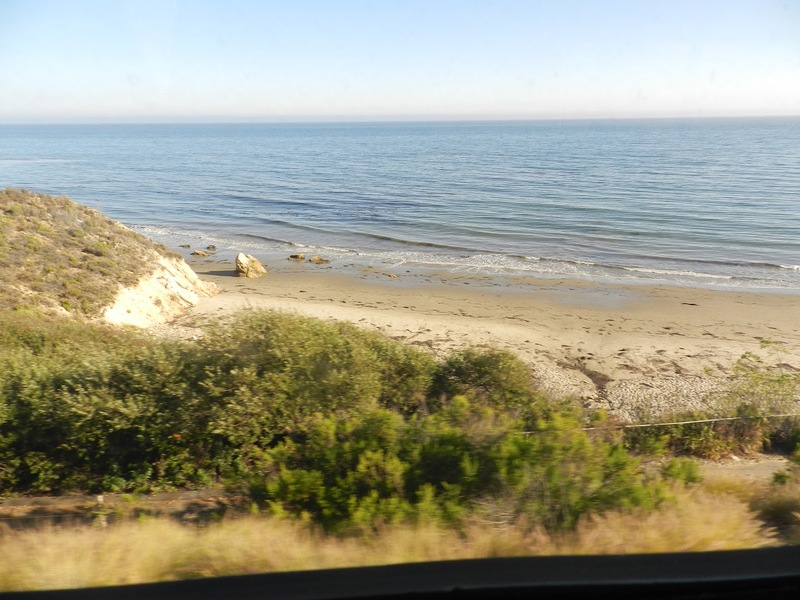 We were sitting in the dining car for supper when we saw sand dunes and a thick layer of fog which peeled back to expose the shore and then the waves. All through the car you could hear gasps and people saying, "Look", or "There it is", etc. We're out in the lovely warm air waiting for our Beach Bus! i'm curious about the train travel. am contemplating using the train for traveling home to Colorado for Christmas with hubby and toddler. worth the extra time? would be going cross country VA to CO. lotsa flatland in between. Hey DeAnna! DebH, and Dina. We just got back from a harbor cruise. Saw Dean Koontz's house, george and Gracie's house and lots of others. And the most precious sea lions. DebH, we'll be giving lots more train details soon, but from my VP, it's a resounding yes it's worth it. But it's one of those things - you either love it or hate it. Maybe a short trial trip first? woo hooo!~ I'm so excited for this experience you are enjoying, ladies! Love the photos and what you've shared of your adventure. And looking forward to more! All this stuff plus the biggest writing conference in the world (I don't know that...I'm just thinking that)! Can't wait to hear about the conference! Well, the bumps in the road make for a memory you will have the rest of your lives. Enjoy! Thanks Deb, Cheryl and Barb. It's been wild! Yes, Barb, the bumps in the road are certainly memorable. Stay tuned in a week or so for more on that! We're in line at Disney, with Susie D and her family. Thank you for sharing this. The pictures look fantastic! So how did the conference go? Thanks, Matt! The conference was huge, almost overwhelming, but still great. Michael Hague and Deb Dixon's workshops were my favorites. I hope to do an overview soon. Probably on a Wednesday. I'll stop back here and let you know when I have a day scheduled.